Valentin Yakovlevich Parnakh - Russian poet, translator, historian, explorer, musician, choreographer, ballet master, one of the most influential personalities of the ''Silver Age'' and one of the leaders of the European and Russian art avant-garde of 1920s, the founder of Soviet Russian Jazz. Valentin Parnakh, brother of the poetess Sophia Parnok and twin brother to the writer Yelizaveta Tarakhovskaya was born in the city of Taganrog on July 26, 1891. In 1913, Parnakh traveled throughout Italy, Middle East, stayed for some time in Palestine, and returned to Saint Petersburg the same year. In Saint Petersburg, he entered the University, where he studied Romance languages, music under direction of Mikhail Gnesin and theater art under direction of Vsevolod Meyerhold. In 1916, he settled in Paris, where he stayed for 6 years. He studied at Sorbonne University and became a true poet and was even elected President of the Paris Chamber of Poets. Among his friends were Guillaume Apollinaire and Pablo Picasso, his books Samum and Slovodvig (Mot Dynamo) were illustrated by Mikhail Larionov and Natalia Goncharova. 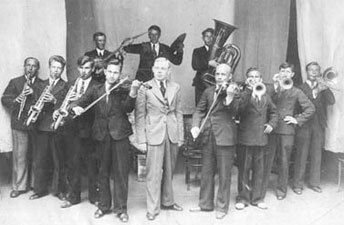 In 1922, feeling distanced from most political immigrants from Russia and fascinated by black jazz music in Paris, he returned to Russia and founded the First Eccentric Orchestra of the Russian Federated Socialist Republic - Valentin Parnakh's Jazz Band, which held its debut concert in the Russian Academy of Theatre Arts GITIS on October 1, 1922, in Moscow. This jazz band of New Orleans style greatly influenced the artists of Russian avant-garde of those days. When the band of Parnakh appears on the stage of the "Trest D.E." (based on Ilya Ehrenburg's novel Trust D.E., 1923) which Meyerhold directed in 1924, it was said that his jazz music won high popularity. From Paris he brought jazz scores, saxophones, tam-tam, and sordinos for trumpets. Parnakh was also creative director for music and choreography at the Meyerhold Theater, where his "eccentric orchestra" performed the hits of that time - "Kitten on the Keyboards" or the ballet suite "The Bull on the Roof". Valentin Parnokh greatly influenced Meyerhold's biomechanics. On May 1, 1923, the band performed before the participants of the Comintern at the Agricultural Expo. The Soviet press of the time wrote: "for the first time jazz music was performed at official state celebrations, never before in the West". He also published numerous articles on the contemporary music culture of the West, being the first to promote the dramatism in art of Charlie Chaplin and the first to introduce French Dadaist poetry in USSR. In 1925, he published his poetry book "Introduction into Dance", featuring poet's portrait by Pablo Picasso. However, his euphoria was gone by 1925, as he understood that Soviet regulations were quite different from his life in Paris with publishing houses refusing his poetry and his translations of the French poet Gerard Nerval. In October 1925, he left for Paris where he stayed until the end of 1931. Valentin Parnakh published many articles on theater and dance in Russian immigrant newspapers and in the French press, translated Spanish literature. The poet returned to Soviet Union at the end of 1931 and served as translator at the Foreign Board of the Writers Union. He continued his translations of Spanish writers, e.g. Federico García Lorca, but the only work to be published in 20 years was his translation of Memoirs by Théodore-Agrippa d'Aubigné in 1949, with his own foreword rejected by the publishing house...During World War II, Parnakh like many other members of the Soviet Writers Union were evacuated to Chistopol and had absolutely no means of support. Desperately seeking for a job, he applied together with poetess Marina Tsvetaeva to the Soviet of Literature Fund asking for a job at the LitFund's canteen. Valentin Parnakh was accepted as a doorman, while Tsvetaeva's application for a dishwasher's position was turned down and she commited suicide six days later, while Parnakh lived on for ten more years and died in his Moscow appartment on January 29, 1951. He was buried at Novodevichie cemetery in Moscow. Valentin Yakovlevich Parnakh was a versatile and gifted person of many interests: musician, dancer, poet and talented translator. November 24, 2012 a memorial plaque was placed in Taganrog on the front of the house, where Valentin and his famous sisters were born.